Throwing confetti dates back to the medieval days where Italians loved throwing things at each other during processions, carnivals and parades. The most common things to throw would include sugared almond sweets called ‘confetti’. Grain or seeds were also thrown as a symbol of fertility and prosperity. In England, this caught on as a way of wishing fertility on newlyweds during pagan times. Confetti is undeniably a massive business, many might even consider a wedding to be a wasted occasion if confetti hasn’t been used. Confetti is something that has to be discussed with the church/wedding venue beforehand. If this photo is something you really want at your wedding then it’s advised to make sure you find this the venue policy out before making the booking. Some vicars can be really fussy about throwing confetti on the church grounds as the dyes in the confetti that often stain the floor when wet. Whatever you do, don’t totally rely on your guests to bring confetti to your wedding. 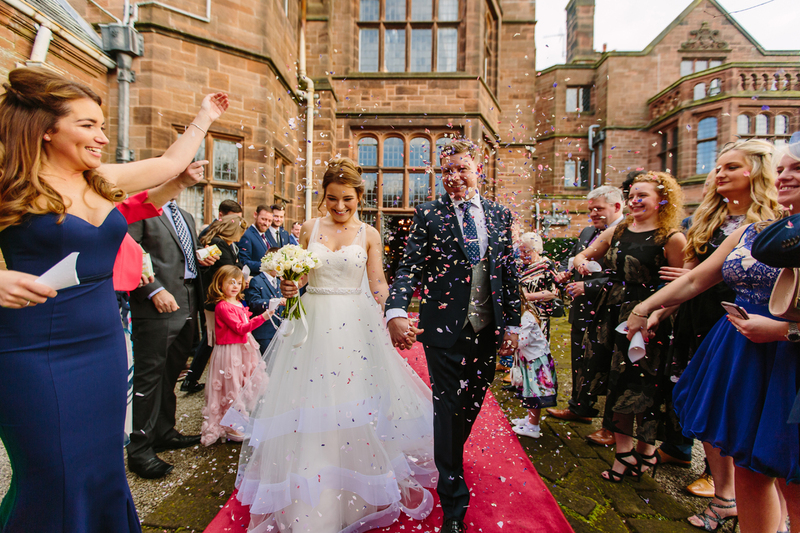 Make sure you buy loads beforehand, ensuring that both yourself and the wedding venue/church know that it complies with their usage policy. Not all your guests will bring there own but the ones that do this ensures that for your photos you have the best images possible. The best way to make sure your photography looks great is to perhaps ask the bests man or a member of your family to help time the shots when photos are taken as this prevents people from throwing the confetti at the wrong time. When would you take this photo? 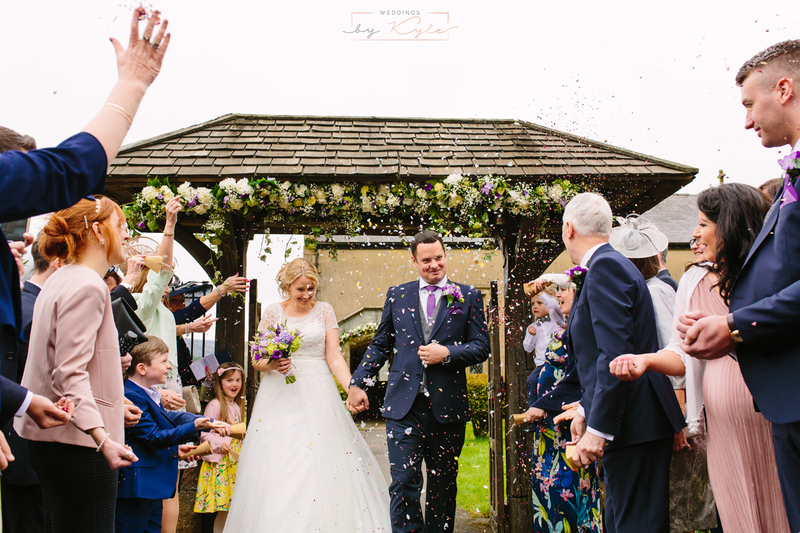 The best time to photograph the confetti shot is straight after the ceremony. All your family and guests will be together in one place and make’s it a lot easier to organise everyone to get in position for the best possible photo. Top tip is to avoid throwing directly into the bride & grooms faces. 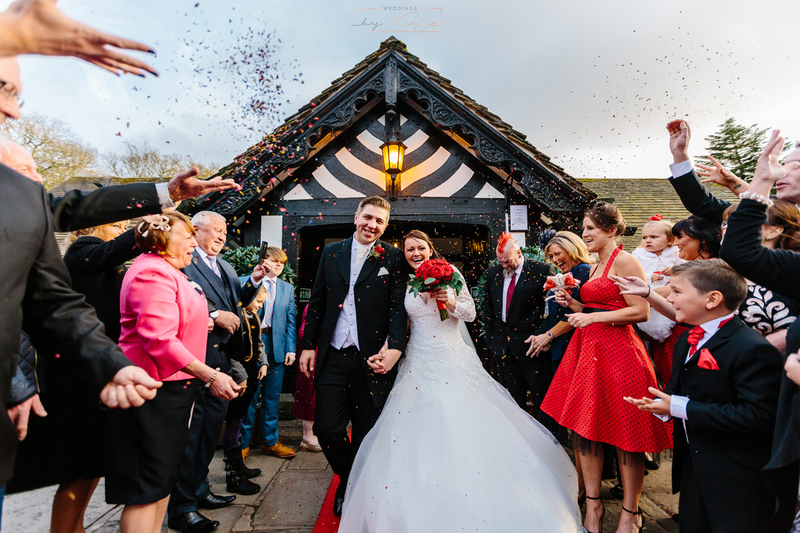 Make sure all the guests throw the confetti up as high as they can to create a beautiful photograph showing the confetti gently fluttering down over the bride & groom. If you do decide confetti is something you want at your wedding make sure to choose 100% biodegradable. There are many different types of confetti to buy from synthetic types to organic paper to natural petal confetti. This is a great option which isn’t harmful to the environment and is the type I would 100% advise most of my wedding clients to buy. The colours in the photos when dried petals are thrown are truly amazing. Oh, and not forgetting the confetti canon…..